Have you seen big cylindrical rolls of baked dough covered in sugar? If you have walked around the main tourist streets of Prague, you must have them lined up with the Chimney Cake shops. A friend of mine suggested going to Good Food in the Old Town to try one. It was a tiny bakery with a few chairs to sit. As you enter the bakery, you’ll see the process of chimney baking in an open fire. This places had so many flavors to select from, including chocolate, tiramisu, pistachio, raspberry, strawberry, and more. Though I was inclined towards Tiramisu, I wanted to try something that I would not normally have. So, I went with a giant Pistachio Chimney with Chocolate Ice Cream. It was one of the best desserts I have ever had. 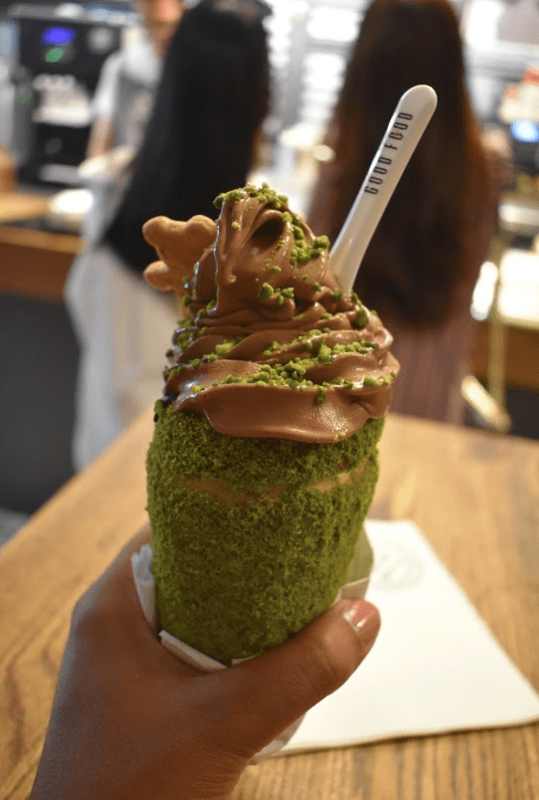 Chimney roll was covered in pistachio crumbs and filled with a decadent chocolate ice cream, it was so rich 😇. It looked exactly like the picture above, so goooooooddd!!!! Oh yes, you won’t feel hungry for the next 5 hours after having the Chimney.